The properties of the anodized aluminum oxide (AAO) membranes are combined with the advantages of the screen-printed electrotransducers and the voltammetric detection mode. Due to this synergy simpler biosensing set-up alternatives and the corresponding methodologies for the detection of DNA  and proteins  even in real blood samples [5,6] have been developed. 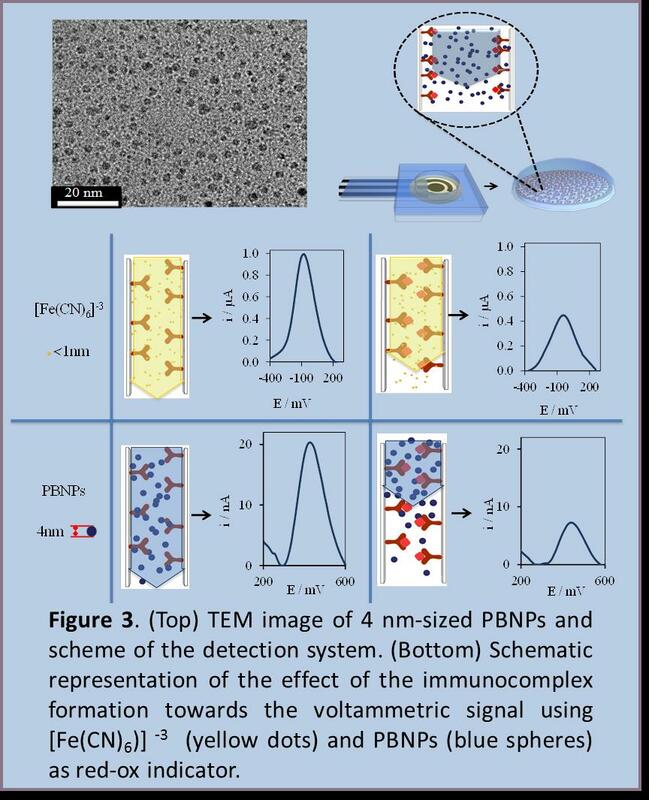 The detection principle is based on the monitoring of [Fe(CN)6]4- indicator ions diffusion through AAO membranes attached onto a screen-printed carbon electrotransducer by differential pulse voltammetry signal change after biomolecule recognition (Figure 1). 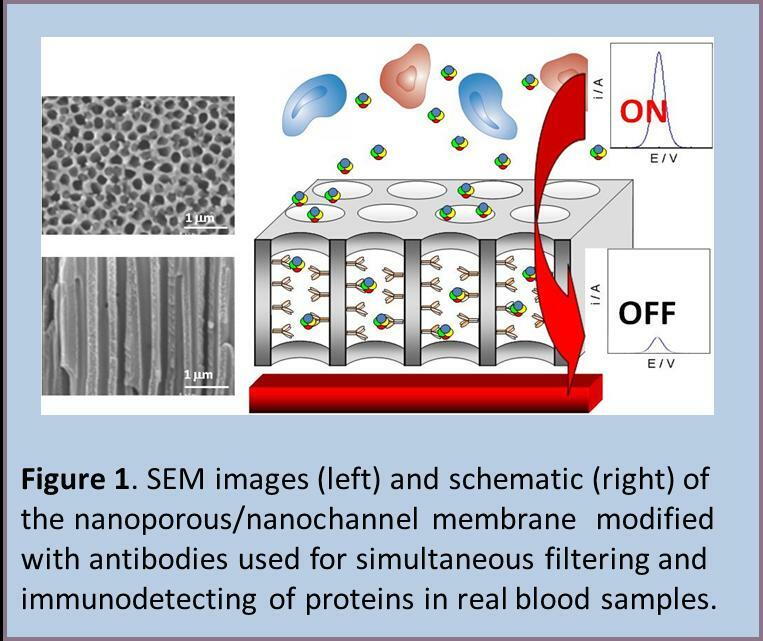 This nanochannels based methodology has enormous potential applications, for example for the analysis of real samples, where the membrane can act at the same time as filter, minimizing matrix effects, and as a simple sensing platform (Figure 2). The practical application of nanoporous AAO membranes based electrochemical sensing systems is limited due to two main factors: i) the membrane and the electrotransducer have to be assembled prior the detection (not integrated system); and ii) the large thickness of AAO membranes (60 µm approx.) makes necessary the use of nanoparticle tags for the enhancement of nanochannel blockage. For these reasons, nanochannels with nanosized thickness integrated on the electrotransducer surface are highly required so as to overcome such limitations. 1. Alfredo de la Escosura-Muñiz, Arben Merkoçi, “Nanochannels Preparation and Application in Biosensing”, ACS Nano 6 (9), 2012, 7556–7583. 2. Alfredo de la Escosura-Muñiz, Arben Merkoçi, “Nanochannels for electrical biosensing”, Trends in Analytical Chemistry, 79, 2016, 134-150. 3. Alfredo de la Escosura-Muñiz, Arben Merkoçi, “Nanoparticle based enhancement of electrochemical DNA hybridization signal using nanoporous electrodes”, Chem. Comm., 46(47), 2010, 9007-9009. 4. Alfredo de la Escosura-Muñiz, Arben Merkoçi, “Label-free voltammetric immunosensor using a nanoporous membrane based platform”, Electrochem. Commun. 12, 2010, 859-863. 6. Alfredo de la Escosura-Muñiz, Wilanee Chunglok, Werasak Surareungchai, Arben Merkoçi. 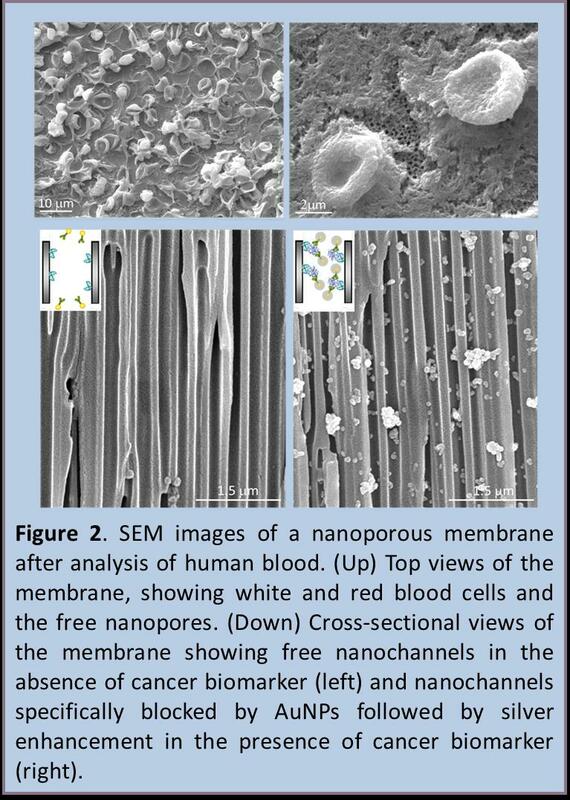 “Nanochannels for diagnostic of thrombin-related diseases in human blood”. Biosens. Bioelectron., 4, 2013, 24-31. 7. Marisol Espinoza-Castañeda, Alfredo de la Escosura-Muñiz, Alejandro Chamorro, Carmen de Torres, Arben Merkoçi, “Nanochannel array device operating through Prussian blue nanoparticles for sensitive label-free immunodetection of a Cancer biomarker“, Biosens. Bioelectron. 67, 2015, 107–114. 8. Alfredo de la Escosura-Muñiz, Marisol Espinoza-Castañeda, Madoka Hasegawa, Laetitia Philippe, Arben Merkoçi, “Nanoparticles-based nanochannels assembled on a plastic flexible substrate for label-free immunosensing“, Nano Research. 8(4), 2015, 1180–1188.